The Policing Authority has thanked O’Sullivan for 36 years of service to the force. 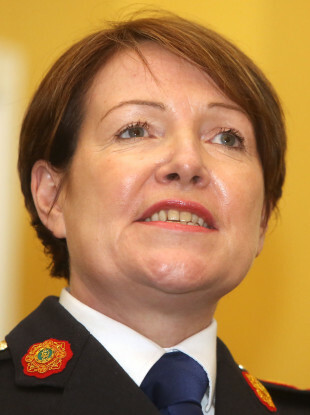 Former Garda Commissioner Nóirín O'Sullivan. GARDA COMMISSIONER NÓIRÍN O’Sullivan’s pension “is fully in accordance with guidelines and regulations set down by the Department of Public Expenditure and Reform,” said Justice Minister Charlie Flanagan. This afternoon, the minister was asked about the €300,000 lump sum O’Sullivan is reportedly set to receive as well as her €90,000 pension. He told reporters O’Sullivan’s pension acknowledges “her long service as member of An Garda Síochana for almost 36 years”. Flanagan added that her pension also acknowledges “the fact she rose to the top, in terms of policing in this country. Her pension will reflect that experience, that expertise and that rank”. He said he appreciated O’Sullivan’s 36 years of service within An Garda Síochána and wished her well in her retirement. O’Sullivan took many in government by surprise yesterday evening when she announced her retirement. The minister said he hadn’t spoken to O’Sullivan since before she went on her five-week summer break, but added that he wasn’t surprised by her decision. He said he believes she acted “in the best interests of An Garda Síochána” throughout her “long and distinguished career”. Flanagan told reporters today that he is pleased the Policing Authority has begun the process to select O’Sullivan’s successor, but said finding a replacement is likely to take months. Minister Charlie Flanagan speaking to reporters in Dublin today. He said that he would not have any concerns about someone from outside the country overseeing national security, adding that this was an opportunity to broaden the base and to look at the labour market to find the best candidate. “It may include an international selection process, it may not,” he said. “There have been difficulties within the Garda Síochana. It has been a very difficult time. There have been challenges, there have been problems. I am very keen to ensure we can move on to a better place,” he said. Due to the difficulties mentioned, the minister was asked by one reporter if believed the role of leading the Irish police force is now a “poisoned chalice” – one that no one would be interested in taking on. “I accept there are challenges, of course. There have been difficulties and problems,” he said, adding that he believes there is an “appetite” within the gardaí, across all levels and ranks, to deliver reforms that will ensure the gardaí is “on par” with other police forces around the world. Calls had been mounting in the last year for the commissioner to step aside due to the ongoing scandals emerging from the force. Last week, An Garda Síochána revealed the full scale of the breath test scandal. Its internal investigation found a discrepancy of 1.4 million tests over an eight-year period. In July, members of the Public Accounts Committee (PAC) said O’Sullivan’s position was untenable following the committee’s findings in relation to financial irregularities at Templemore training college. In its damning report, the PAC criticised a culture within the force of “withholding information, providing inadequate information and keeping issues internal to avoid external awareness and scrutiny of very significant financial issues” in the college. There was a mixed reaction to O’Sullivan’s decision since yesterday’s announcement. Minister for Employment and Social Protection Regina Doherty told the Irish Times O’Sullivan was “an incredible role model for women in this country”, later praising her “grit and determination”. Speaking to RTÉ Radio 1′s Morning Ireland today, Solidarity TD Paul Murphy said many people were “shocked” by Doherty’s comments, given “scandal after scandal after scandal” in An Garda Síochána. I was surprised that [O'Sullivan] has held on as long as she has, that she wasn’t pushed out at an earlier stage. Murphy said it was “inevitable” O’Sullivan had to go, but that the timing “maybe is a bit surprising”. He questioned whether the hierarchy of the force was “irreformable”, saying O’Sullivan is “likely to be replaced by a similar figure”. Also on Morning Ireland, Sinn Féin’s deputy leader Mary Lou McDonald said O’Sullivan departure came “very belatedly” but offered an opportunity for reform within the force. I’m very glad that she has done the right thing finally. She added that someone “uncontaminated” by scandal is needed to lead the force. The Association of Garda Sergeants and Inspectors (AGSI) paid tribute to Garda Commissioner Nóirín O’Sullivan following the announcement of her retirement after a three-year tenure. AGSI General Secretary John Jacob said O’Sullivan initiated reform within An Garda Síochána. “We had a good working relationship with the Commissioner. I would like to pay tribute to Commissioner O’Sullivan who displayed great character and determination in the face of a series of controversies affecting our organisation and her staff. “We would like to see operational transformation prioritised by her successor and we look forward to working with him or her when appointed by the Policing Authority. The Policing Authority also released a statement about O’Sullivan’s announcement, saying it was informed of her decision yesterday afternoon. “The Authority acknowledges with appreciation the service given by Nóirín O’Sullivan to the State and to policing in Ireland over 36 years and wishes her well in the next phase of her life. “The authority agrees with Ms O’Sullivan that the modernisation and reform programme in the Garda Síochána must continue and will work with her successor in that regard,” the statement read. Announcing her retirement yesterday, O’Sullivan said the “unending cycle” of committees and public hearing she had to attend was making it difficult to implement reform within the force. “It has become clear, over the last year, that the core of my job is now about responding to an unending cycle of requests, questions, instructions and public hearings involving various agencies including the Public Accounts Committee, the Justice and Equality Committee, the Policing Authority, and various other inquiries, and dealing with inaccurate commentary surrounding all of these matters. They are all part of a new – and necessary – system of public accountability. But when a Commissioner is trying – as I’ve been trying – to implement the deep cultural and structural reform that is necessary to modernise and reform an organisation of 16,000 people and rectify the failures and mistakes of the past, the difficulty is that the vast majority of her time goes, not to implementing the necessary reforms and meeting the obvious policing and security challenges, but to dealing with this unending cycle. As of midnight, Deputy Commissioner Dónall Ó Cualáin became Acting Commissioner. Email “Minister says Nóirín O'Sullivan's pension will reflect her 'experience, expertise and rank'”. Feedback on “Minister says Nóirín O'Sullivan's pension will reflect her 'experience, expertise and rank'”.